Customize your theme in the way you like. First of all, we would like to thank you for purchasing our Theme. If you have any questions that are beyond the scope of this help, please feel free to email us via our user page contact form here. We'd be glad to help you if you have any questions related to this theme. No guarantees, but we'll do our best to assist. If you have a more general question relating to our themes you might consider visiting our support forum. We always care the most about our customers so we know how valuable is their time. To make your life easier we included all necessary components that can improve your work on a day to day basis. Please follow the video to install the Chirps Theme, recommended plugins and import the demo content in just few clicks. Please follow the video to update the Chirps Theme in just few clicks. Now when your logo is uploaded, you can adjust the margins around it in the WordPress Admin › Appearance › Theme Options › Design › Header section. To make your logo look sharp on high-resolution screens, please upload double-sized logo in the WordPress Admin › Appearance › Theme Options › Design › General › Desktop Logo (High DPI). The theme detects which version to use to make the best viewing experience. With a little effort you can stop worrying about different color schemas behind your logo. Prepare two extra versions of your logo. One for the light (eg. white, yellow) and one for the dark (eg. black, brown, grey) background. Upload these logos in the WordPress Admin › Appearance › Theme Options › Design › General › Desktop Light Logo/Desktop Dark Logo. Of course you can also make them retina ready by uploading double-sized versions. By default WordPress displays latest blog entries on the homepage. Of course you can change it easily. Nearly every element has its own color settings, so you can overwrite the global ones and add custom colors per item. This way you can place e.g. multiple buttons with different colors on the same page. Most elements can be restyled using the Page Builder or the Shortcode Generator. Additionally every More Than Menu provides its own interface to change the color scheme. G1 Page Builder is a plugin that lets you build your pages using intuitive graphic interface. The plugin is built into the theme so after theme activation you will be asked to install it. This plugin has no administration page, all you need to do is to go to any of your page and enable it. To update the plugin, go to the WP Admin Panel › Appearance › Install plugins, find the "G1 Page Builder" plugin on the list and click "Update" right below it. If you can't find the Install plugins link in the WP Admin › Appearance section, all your plugins are up to date and you don't need to update anything. Please read this section if you start using the builder on a page that was previously created manually (with plain html and shortcodes). Graphic interface should help you create your pages quicker and easier. You can stop thinking about shortcodes and focus on your significant content. When you build your page from scratch using our builder, all your markup will be created correctly by the builder. On the other hand, if you have pages created before the builder was launched, you can come across some little problems with your old markup. Sometimes builder won't be able to recognise some elements (eg. if you made a typo with shortcode name). In this case you should check and fix your markup. After first switch to our builder, you will see the "Cancel" button. If you see any problems with your layout, please use it to return to the original content. Check your markup, fix all problems and then switch to the builder again. You can easily create a new SOME_FILE.js file inside the child theme folder and move your inline code there. This will keep separation between content and script logic. Go to the WP admin panel › Appearance › Widgets. On the right side of the screen there is a column containing all existing sidebars. Below them you can also find the "Add a new sidebar" form. Enter the name of your new custom sidebar in the text input field. A sidebar's name can only consist of: lowercase and uppercase letters, digits, underscores and hyphens. Then, when editing a single entry, a category or a tag, select this newly created sidebar from the "Sidebar" dropdown. One of the most powerful and flexible elements delivered with the theme is the "Posts" element. Besides other configuration parameters it has the "view" option that lets you define how to display a collection. Choose the "carousel" view if you want to rotate your posts. How to create a filterable collection of posts? One of the most powerful and flexible element delivered with the theme is the "Posts". Besides other configuration parameters it has the "view" option that lets you define how to display a collection. Choose the "filterable" view if you want to use taxonomies (category, tag) filters. The Chirps Theme comes with many custom shortcodes you can use to spice up your content. When editing the content in both Visual and HTML modes, click the “[/]” icon (see the image below) to open up the Shortcode Generator. This little tool provides a user friendly interface for all shortcodes and code snippets. For each single article you have few different templates to choose. You can use the creative or the classic one, with sidebar or without it. To set the same template for all articles, please go to the WP Admin › Appearance › Theme Options › Posts › Single and choose the appropriate template. You can override global configuration by setting template for a specific article. To do this, please go to your post edition view, scroll down below the content editor and choose the template in the "Single Page Options" box. For each single post you can define which elements should be visible and which not. You can do this individually for a single post or for all posts at once. To hide eg. the Breadcrumbs for all posts, go to the WP Admin › Appearance › Theme Options › Posts › Single and set the "Breadcrumbs" to "hide". To hide eg. the Title only for some specific post, go to the post edition view, scroll down below the content editor, and in the section "Single Page Options" set the "Title" to "hide". The gallery shortcode allows you to add one or more image galleries to your posts and pages. where the ids attribute represents ids of images. But who wants to check images ids and compose shortcode manually. Not to mention other attribute names. There is a much more user friendly way to manage your galleries. The Wordpress gallery, by default, can be used only for displaying images. We extended this functionality to give you a more powerful tool. When you edit your gallery you can choose the "Lightbox" option for the "Link to" setting (under the Gallery Settings). Go to the Gallery Settings (gallery edition view, right sidebar). Set the "Slider" to "on". Then decide if you want to show next/previous and coin navigations. In some cases you don't want to have comments, pings and trackbacks enabled on your posts/pages. Comments are not needed, mostly, on regular pages. On posts they are preferred but it's always better to have an option to disable them. Set the "Allow Comments" to "off". Set the "Allow Trackbacks And Pingbacks" to "off". Those settings will be applied only for new posts. For existing posts you need to turn on/off comments manually (see the Hide comments, pings and trackbacks individually section). Those settings will be applied only for new pages. For existing pages you need to turn on/off comments manually (see the Hide comments, pings and trackbacks individually section). To display featured posts at the top of your category page, first you need to mark some posts from this category as sticky. The next step is to enable the "Featured Entries" section for this category. You can define how many posts will be displayed on your category page in the WP Admin › Posts › Categories › YOUR CATEGORY by setting the "Entries per page" value. Leave this field empty to inherit from the global configuration, set -1 to show all. If you want to use the same value for all your categories, you don't need to set it up separately for each category. Just go to the WP Admin › Appearance › Theme Options › Posts › Categories and set the "Entires per page" for all categories. For each category you have few different templates to choose. You can use grid (columns) or list, with sidebar or without it. To set the same template for all categories, please go to the WP Admin › Appearance › Theme Options › Posts › Categories and choose the appropriate template. You can override global configuration by setting template for a specific category. To do this, please go to your category edition view (in the WP Admin › Posts › Categories) and choose your desired template. The "Load More" button is really useful when you want to show just few posts at the start and load others dynamically. It works very similar to the traditional pagination but you stay all the time on the same page (new posts are appended at the end of the collection without reloading). The "Load More" button allows your visitors to see as much posts as they want to "in place". This isn't so important for archive pages but becomes crucial on pages with more than one collection (which is rather standard for magazine sites). Set the "load more button" for the "Pagination" option. In the WP Admin > Appearance > Theme Options > Posts > Categories, you can define the "load more button" for the "Pagination" option for all your categories. Then if you want to change it on some specific category, go to the WP Admin > Posts > Categories > YOUR CATEGORY and override the "Pagination" option. In the WP Admin > Appearance > Theme Options > Posts > Tags, you can define the "load more button" for the "Pagination" option for all your tags. Then if you want to change it on some specific tag, go to the WP Admin > Posts > Tag > YOUR TAG and override the "Pagination" option. The posts shortcode has built-in option for the "Load More" button. You need to remember that it works only for the standard view. For filterable and carousel views the "Load More" option doesn't make sense and cannot be used. Magazine themes like any others consist mainly of text, so the typography plays a vital role in the final impression. Luckily for you, the Chirps Theme provides the right tools to get the job done. You can customize the typeface, font-size, letter-spacing and text transformation for various elements in the WP admin panel › Appearance › Design › Typography. This set of headings is intended to use for post titles. Although it's not written in stone, we typically use narrower or condensed typefaces here, like Oswald or Roboto Condensed. The main reason for it is of course to save space. This set of headings is intended to use for section headings, archive titles. This set of headings is intended to use for subheadings and subtitles. The Chirps Theme makes use of many image sizes to render collections and single article pages. Please remember to use the Force Regenerate Thumbnails plugin afterwards, to regenerate old thumbnails. The Preheader theme area is mostly used for a secondary navigation or to add some other links. You can use it to put your Log In or Register link there. Choose the big X (none) as the Composition value. Sticky elements, header and menu in particular, can improve user interactions on your site. All necessary links are always available so user can easily "jump" from one page to another without scrolling back to the top. To enable sticky preheader, please go to the WP Admin > Appearance > Theme Options > Design > Preheader and set the "Sticky position" to "on". To enable sticky header, please go to the WP Admin > Appearance > Theme Options > Design > Header and set the "Sticky position" to "on". To enable sticky menu, please go to the WP Admin > Appearance > Menus > YOUR MENU. Now, scroll down to the "More Than Menu Settings", select the Layout > Menu tab and set the "Sticky" to "on". Please don't use sticky menu and sticky preheader/header option at the same time. In most cases the sticky header will be a better choice than the standalone sticky menu. Your server has defined how many items can handle in one request. This value varies between different servers, especially shared hostings. When you try to add more menu items and they exceeds the limit, any items beyond that limit will be truncated from the end of the menu. It can also manifests by reseting menu locations assignments. First approach is more robust so you can try to use php.ini first. How to hide menu items for logged out users? When you have a site prepared for both anonymous and registered users, it's always useful to have a possibility to show some specific menu items only for one group of them. How to restrict access to a menu item? Go to the WP Admin Panel › Appearance › Menus and choose your target menu. Now find a menu item you want to change and expand it. Click the Conditional display option from the More Than Menu Settings section. When the popup opens, define who can see this menu item (by default all menu items are visible for all users). How to use a different menu on a specific page? Sometimes it's necessary to use a different menu for a specific page. Let's say you have a landing page and you want to show only few links in its menu. Probably you will also want to hide footer navigation on such a page. Our menu system allows you to do this. Where can I change a menu for a specific page? On each single page, in the right sidebar, you can find the Use other menu box. Using it you can choose different menu for your primary, secondary and footer navigation. Or disable all of them if you want. How to change the font for menu items? In most cases all your menu links will use the same font. But sometimes it's useful to highlight some special link or even an entire menu subtree. Our menu system allows you to override default font for any submenu and even for any individual menu item. Go to the WP Admin Panel › Appearance › Menus and select your target menu. Choose your preferred font for each section or leave it untouched to inherit from default font setting. For each single menu item you there are the same options available as we described in the Global settings section. Just go to a menu item, expand it and click the Layout option under the More Than Menu Settings section. How to add an icon to a menu item? Click the Content option from the More Than Menu Settings section. When the popup opens, select that you want to Use the icon and choose one of available icons from the list. How to use a shortcode/widget inside a menu item? When the popup opens, use the option Display extra content to define where you want to show this content. After this, new field Text, HTML, shortcodes will show up. Place your content inside it. How to configure phone/tablet optimized menu? For today's modern websites mobile optimisation is a must. Sites have to be responsive to allow users to navigate through them easily. On smaller devices, like phones and tablets, menu is one of the most important part. We put a lot of attention to make our menu system as much user friendly as possible. You can define for which screen sizes you want to use default, desktop version of menu and when to switch to mobile menu. Below the menu structure, under the More Than Menu Settings section, select the Layout and then Menu tab. You should see the section called Mobile Menu and the subsection Tablet Optimised. You can set there mobile menu switching point. It can be any custom width or one from predefined options. Decide also which type of mobile menu is most appropriate and if the Toggle button should be visible or not. You should see the section called Mobile Menu and subsection Phone Optimised. You can set there mobile menu switching point. It can any custom width or one from predefined options. Decide also which type of mobile menu is most appropriate and if the Toggle button should be visible or not. How to display the search form in a submenu? Add a regular menu item (let's say we called it Search Form) as a subitem of the Search menu item. Now you need to add the search form shortcode, as an extra content, to the Search Form. To do this, please click the Content option from the More Than Menu Settings section (if you can't find this option, please check this article first). How to change the hover color of a link? In most cases all your menu links will have the same look (in default, highlight and hover state). But sometimes it's useful to highlight some special link or even an entire menu subtree. Our menu system allows you to override this default color schema for any submenu and even for any individual menu item. Below the menu structure, under the More Than Menu Settings section, select the Style tab. Choose your preferred hover color for each section or leave it untouched to inherit from the default color setting. For each single menu item there are the same options avialable as we described in the Global settings section. Just go to a menu item, expand it and click the Layout option under the More Than Menu Settings section. How to open custom content in the off-canvas area? Now find a menu item that will open the off-canvas area. When the popup opens, for the option Display extra content, select the in left offcanvas or in right offcanvas. After this, new field Text, HTML, shortcodes will show up. Place your content inside it. How to open a custom content in the popup? Now find a menu item that will open the popup and expand it. When the popup opens, for the Display extra content choose in lightbox option. How to create a menu divided into two parts? You can split your menu into two separate parts. It's really useful if you have elements like search icon or follow links that shouldn't be combined with other, more important, business specific links. Divided menu makes a logical separation between items, giving your visitors better user experience. How can I split a menu? Scroll down to the More Than Menu Settings and select the Layout › Menu tab. From the available options, set the How to align menu items? to left right. The link "Move to the split point" will show up, click it. Now you can move the split point using drag and drop. How to manage the menu in the preheader? Select it as the Secondary Navigation in the WP Admin Panel › Appearance › Menus ›Manage Locations tab. The Theme comes with a post formats support. We paid a lot of attention to each post format so all looks nicely and behaves as you might expect. If you set the Featured Image for a post, it will be used to present post in a collection view. When a specific post format defines otherwise, it can use e.g. a slider what is true for a gallery post format. If you don't set the Featured Image, a placeholder (symbolic representation) will be used instead (lightbox doesn't apply in this case). Both, featured image and placeholder, point to single view page. In a single view if the Featured Image is set and it's enabled (via Single Page Options) it will be used. Each post format can use different type of presentation for its featured media. For example, if you set YouTube link for a video post format, a video player will be loaded instead of the Featured Image. To read more about different post formats presentation types, please refer to below sections. If you're not familiar with the post format concept, first please refer to the Post Formats Overview. When to use the audio post format? If an audio is the most important part of your post. When you edit a post, in the right sidebar you should see the Format meta box. If you choose the audio post format, the Audio Url (oEmbed or mp3) or Embed Code field will show up above the content editor. Put your audio url or embed code there. How it looks and behaves in a collection view? If you set the Featured Image for this post type, it always be used to present post in a collection view. After clicking the image, the audio will be open in the lightbox popup. If you don't set the Featured Image, a placeholder (symbolic representation) will be used instead (lightbox doesn't apply in this case). How it looks and behaves in a single view? If you set an audio url or embed code, an audio will be loaded (using the built-in audio player) on top of your post content. In other case, the Featured Image will be used. Don't forget to check if the Featured Media (in Single Post Options) is not set to hide. When to use the image post format? If an image is the most important part of your post. When you edit a post, in the right sidebar you should see the Format meta box. Choose the image post format and set the Featured Image. If you set the Featured Image for this post type, it always be used to present post in a collection view. After clicking the image, the large version will be open in the lighbox popup. If you don't set the Featured Image, a placeholder (a symbolic representation) will be used instead (lightbox doesn't apply in this case). If the Featured Image is set, it will be displayed on top of your post content. Don't forget to check if the Featured Media (in Single Post Options) is not set to hide. When to use the gallery post format? If a set of images is the most important part of your post. When you edit a post, in the right sidebar you should see the Format meta box. Choose the gallery option and upload some images to this post (you can use the Add Media button, above the content editor). If you set the Featured Image for this post type, it always be used to present post in a collection view. After clicking the image, the whole gallery will be open in the lighbox popup. If you don't set the Featured Image, a slider will be used. If the Featured Image is set, it will be displayed on top of your post content.If there is no Featured Image but some images were uploaded to this post, a slider will be loaded. When to use the video post format? If a video is the most important part of your post. When you edit a post, in the right sidebar you should see the Format meta box. If you choose the video post format, the Video Url (oEmbed) or Embed Code field will show up above the content editor. Put your video url or embed code there. If you set the Featured Image for this post type, it always be used to present post in a collection view. After clicking the image, the video will be open in the lightbox popup. If you don't set the Featured Image, a placeholder (symbolic representation) will be used instead (lightbox doesn't apply in this case). If you set a video url or embed code, a video will be loaded (using the built-in video player) on top of your post content. In other case, the Featured Image will be used. Don't forget to check if the Featured Media (in Single Post Options) is not set to hide. Wordpress uses the GNU gettext localization framework to provide localization infrastructure (.po/.mo files). You probably don't want to create .po/.mo files manually so that's all you need to know for now. Of course if you're a developer or just want to learn more, please visit the Translating WordPress documentation page. In order to localize your theme and plugins, create a directory named "languages" inside of "wp-content", if it does not already exist. Make sure that your web server has write permissions to this directory. If you're not familiar with this subject, please first read about Wordpress file permissions. To prepare a translation, you can choose from different tools or plugins. If you decide to use a desktop program, we recommend to use the poEdit. It's free. 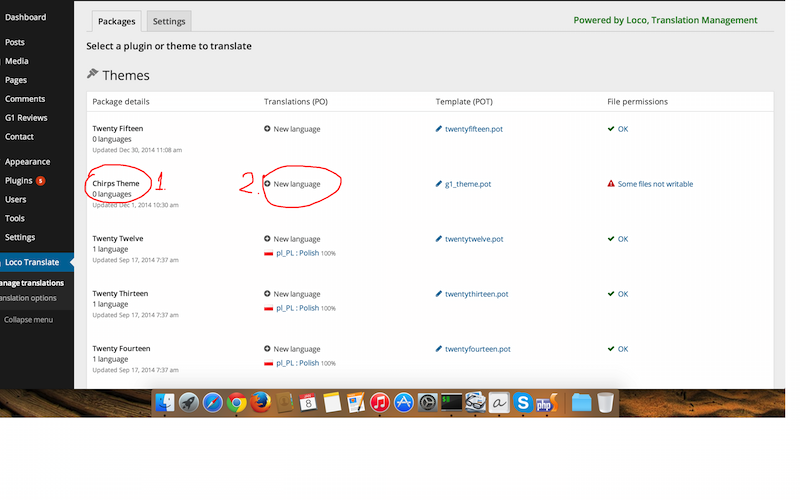 But, in our opinion, more efficient way to handle theme/plugins translations is to use the Loco Translate plugin. This is always good to have all necessary tools handy, without switching to external programs. The "Loco Translate" plugin has also its online alternative which makes it useful for editors (that have no access to your admin panel). The WPML is the most powerful plugin to translate Wordpress. It's not free (it costs about 79$) but it's worth its price. If you decide to use it, please read the String Translation section to learn how to translate theme/plugins phrases (anything that doesn’t fall inside posts, pages or taxonomy content). Install the Loco Translate plugin. Go to the WP Admin Panel › Loco Translate. Click "New language" (screen 1, point 2). Select your language (let's say "Spanish", code "es_ES"). 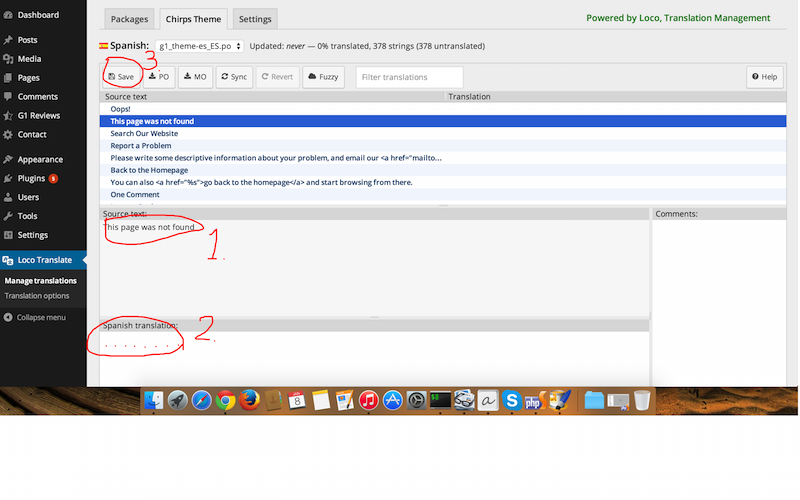 Under the language code field you can see an option to decide where to store your translation. Choose the "create in global languages directory" option. If you don't see any option that's fine, translation will be stored in global directory. Click "Start translating". Translate all phrases (screen 2, point 1 and 2) and click "Save" (screen 2, point 3) to generate all necessary translation files. Because we don't use the theme/plugins related directories to store translations you have nothing to worry about. All custom translations are stored in the wp-content/languages directory so unless you reinstall the entire Wordpress installation, all is safe there. You can update the theme and each plugin without losing their translations. You don't even need to use the child theme. You will probably want to modify this theme somehow. We strongly recommend to use the Child Theme then. That way, when the parent theme is updated, your modifications are preserved. You don't have to create your own child theme, just use the one from the zipped file downloaded from ThemeForest. Where should I place my CSS modifications? All your custom CSS rules should be added to the style.css file form the child theme. You can access it directly from the WP admin panel › Appearances › Editor. Wordpress has to generate each page each time your visitor comes to it. This is always a costly operation, forcing your web server to waste its resources (mainly CPU and memory). You are probably aware of the fact that it is not necessary to do that. All visitors can (and should) see the same page version (for some defined period of time or at least until next modification). You should always cache your site and eliminate all additional components (e.g. plugins) that can slow down caching process (page will be generated only once but this also can take a while). If you are not familiar with the WP Super Cache plugin and you're looking for a quick start guide, please check the How to Install and Setup WP Super Cache for Beginners tutorial. Another good practice to provide best site performance is to use only the necessary plugins. Less plugins means less resources to process and faster site. Make sure that all your active plugins are really needed and if not please deactivate (or remove) them. Our theme is delivered with a lot of built in components so before you decide to use a 3rd party extension, please check if the theme doesn't provide it already. All modern browsers support and automatically negotiate gzip compression for all HTTP requests. Enabling gzip compression can reduce the size of the transferred response by up to 90%, which can significantly reduce the amount of time to download the resource, reduce data usage for the client, and improve the time to the first render of your page. See How to Optimize Your Site with GZIP Compression to learn more. G1 Reviews is a plugin to show article rating based on defined criteria. How to add new review criterion? To add/remove a review criterion please go to the WP Admin Panel › G1 Reviews section. After activating this plugin, in the posts shortcode/widget, for the "type" field, you can select the "top rated" option. This will allow you to sort your posts based on their ratings. To update the plugin, go to the WP Admin Panel › Appearance › ›Install plugins, find the "G1 Page Builder" plugin on the list and click "Update" right below it. If you can't find the Install plugins link in the WP Admin Panel › Appearance section, all your plugins are up to date and you don't need to update anything. The plugin is delivered with both shortcode and widget. The widget can be found under the WP Admin Panel › Appearance › Widgets section. 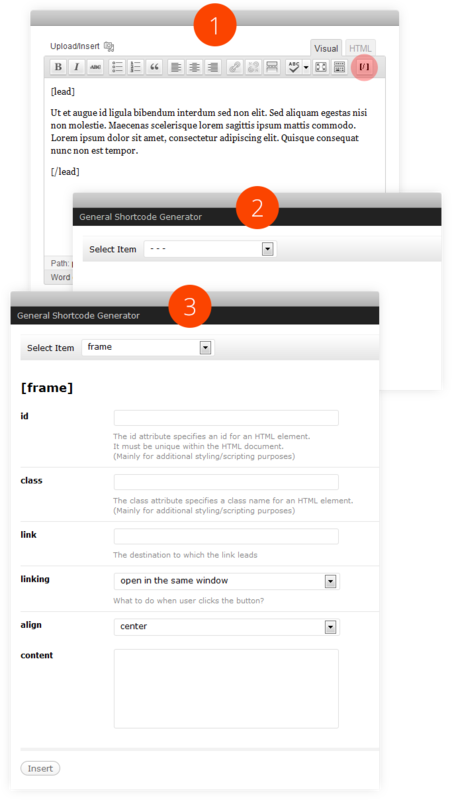 The shortcode can be used via our shortcode generator or as a page builder component. G1 Ads is a plugin that lets you embed advertisements on your site (Google Ads, image posters). This plugin has no administration page. All you need to do is to add it to your page via shortcode or widget. Where to find Google Ad Publisher Id and Slot Id? On your Google AdSense account, find the ad you want to place on your site and using the "Get Code" button generate it. It should look like the below example (highlighted parts are the ones you are looking for). The plugin is delivered with both shortcode and widget (G1 Ad and G1 Google Ad). The widgets can be found under the WP Admin Panel › Appearance › Widgets section. The shortcode can be used via our shortcode generator or as a page builder component. To update the plugin, go to the WP Admin Panel › Appearance › Install plugins, find the plugin on the list and click "Update" right below it. G1 Quotes is a plugin to show your quotes, testimonials or recent comments with different templates. The plugin is delivered with both shortcode and widget. The widget can be found under the WP Admin Panel › Appearance › Widgets section. The shortcode can be used via our shortcode generator or as a page builder component. G1 Users is a plugin to list blog authors using different templates (list, gallery). After activating the plugin the "Author summary" filed is added to each user profile edition page. An author can add an additional info about itself. This info will be displayed on author page, in author's quotes. G1 Socials is a simple plugin that lets your users follow you via your social channels. After activating the plugin its configuration page will be accessible under the WP Admin Panel › Appearance › Theme Options › Socials. How to add new icon? To add new icon you need to use the "g1_socials_items" hook. We strongly recommend to add all new icons via our child theme. Below the child theme functions.php file showing how to use the hook to add/remove icon. Now, you need to add your icons to the folder you specified (via "icon_dir" parameter). You should add icons in all sizes: 16px, 24px, 32px and 48px. Icons should be in the png format. The icon list interface is sortable. You can easily change an icon position just by dragging it (move mouse over a title) after/before other icon. To update the plugin, go to the WP Admin Panel › Appearance › Install plugins, find the "G1 Socials" plugin on the list and click "Update" right below it. G1 Twitter is a plugin that lets you easily show your latest Tweets on your site. First you need to set up some basic data like your username and decide if you want to use a regular list or rather a carousel. These options will be used as default options for all shortcodes invoked without attributes. This can be really useful if you want to embed your Tweets in few places but with the same configuration. Of course you can override each option, using shortcode attribute directly. To prevent exceeding Twitter downloads limits, it's a good idea to define cache duration time. It's not necessary to fetch new Tweets for each new visitor on your site. Tweets should be kept in cache and revalidated after eg. each hour (3600 seconds). To send secure authorized requests to the Twitter API Twitter uses oAuth access to its API. More information how to properly configure the API can be found in the WP Admin Panel › Appearance › Theme Options › Twitter › oAuth Authentication section. To update the plugin, go to the WP Admin Panel › Appearance › Install plugins, find the "G1 Twitter" plugin on the list and click "Update" right below it. G1 Mailchimp is a plugin that lets your visitors quickly subscribe to your newsletter. You need to choose a mailing list but you can't do this without providing your Mailchimp API key. Please set it first and click "Save changes". After reloading the page you should see all available lists. If you don't see any list there, please check if you configured them properly on your Mailchimp account. You can also decide if your users should subscribe just by adding their emails or you want to collect also their names. To update the plugin, go to the WP Admin Panel › Appearance › Install plugins, find the "G1 Mailchimp" plugin on the list and click "Update" right below it. Waypoints - Waypoints is the easiest way to trigger a function when you scroll to an element. Right now the download package includes fully layered, Adobe Photoshop .PSD file of the home page. We will successfully add new pages. All fonts used in the template are available from the Google Fonts Directory for free. Every file is well organized and contains grid helper lines for your convenience. All used 3rd party scripts are listed on the Sources and Credits page. The first rules in g1-screen.css file are generic reset rules. Many browser interpret the default behavior of html elements differently. By using a general reset styles, we can work round this. Documentation - an entry point to the online documentation. Online version it's always up to date. The Theme comes with some custom widgets ready to use. All custom widgets names start with the G1 prefix. All available widgets can be found in the WP Admin › Appearance › Widgets. Changing a single article template? Managing the menu in the preheader?